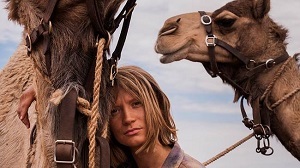 It seemed appropriate that I saw Tracks on International Women’s Day, since John Curran’s film tells the true story of Robyn Davidson (Mia Wasikowska), who at the age of 27 sets out on foot from Alice Springs, heading for the west coast. She is accompanied only by her dog and four camels. Sponsored by ‘National Geographic’, she periodically gets visited by photographer, Rick Smolan (Adam Driver), who captures her journey for the magazine. Wasikowska is at the top of her game in Tracks (is she ever anything but?) and her portrayal is worlds away from her performance in Stoker. Robyn is determined and resourceful, yet dislikes the company of others. Driver plays Rick as dorky yet well-meaning, and they make for a great onscreen odd couple. Most exciting for a weirdo like me is the fact that this is a Camel Movie – something you don’t see very often. The fact that we have a gajillion wild camels out in the Australian desert is rarely touched upon in outback-set films, so Tracks boasts a unique spin on the types of images we’ve seen in many, many Aussie films over the years. The genius of Tracks is that it doesn’t offer any glib explanations for Robyn’s actions. The script throws a lot of things into the mix – her absent mother, the dog from her childhood – but it’s never so gauche to say “this all happened because of X.” At the same time, the film avoids becoming too abstract or wishy-washy. The film deals with the treatment of Aborigines respectfully and without feeling preachy, whilst Roly Mintuma provides one of the film’s best characters as Eddie, an old bloke that accompanies her part of the way. The use of voice over in the early portion of the film isn’t really necessary, but it does help the film hit the ground running, rather than starting out overly contemplative or arty. By sticking with Robyn throughout the entire film, however, you realise just how rare a beast this is: a film about a woman doing something for her own reasons, whilst the male characters are mostly tangential. There are a handful of moments that aren’t handled in the way I would have liked, but aside from these, Tracks is close to flawless. Wasikowska’s performance is pitch perfect, and the film is an emotional experience whilst never becoming schmalzy. I can’t recommend this enough.